Stainless steel band sealers allow you to seal all types of plastic material at the width you desire. 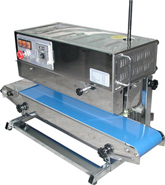 Horizontal continuous band sealers are ideal for sealing short bags that are wide and/or thick. Vertical continuous band sealers seal your bags in a upright position. Ideal for sealing spillable items such as liquids, powder and grains. All four of the sealers have a PTFE band, seals bags up to 20 mil thickness, and are adjustable for height, heat, and speed. Also these units come optional with an embossing wheel for embossing alpha numeric information on your seal.